The Inferno is the successor to the Fight Caves – designed to be the most difficult solo challenge in the entire game. Like the Fight Caves, the player must battle through 68 waves which get increasingly more difficult until finally, you must beat the final boss of the Inferno – TzKal-Zuk. It is possible to get The Inferno as a slayer task, which can help significantly reduce the difficulty of the challenge – but this slayer task will only be awarded to players who have already completed The Inferno at least once. Upon completion of the Inferno, players will be awarded the Best in Slot melee cape in the game – the Infernal Cape. The most common tactic for completion of The Inferno is to use Ranged. Ideally, a Ranged level of 90+ in combination with a Twisted Bow will allow most players – with a lot of practice and a bit of luck – to complete The Inferno. It is highly recommended to only attempt The Inferno at a very high level, and with some of the best gear in the game. While it is possible to complete The Inferno at lower levels and with low-level gear, it is not for the faint-hearted! Just like the Fight Caves, a variation in tactics and prayers need to used throughout The Inferno in order to make it to the end efficiently and effectively. 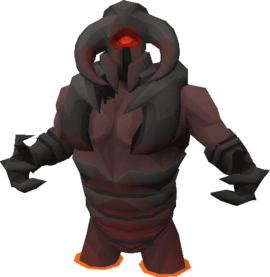 The final wave – Wave 69 – will see you put up against the toughest solo boss monster Old School Runescape has ever seen – TzKal-Zuk. In order to make it to the end of this fight, you must continuously keep yourself guarded against his vicious ranged attacks by moving back and forth and hiding behind a floating chunk of pillar. Whilst keeping yourself guarded, at opportune moments you will be able to fire off a single arrow before having to retreat again to the safety of the pillar. If you make a single mistake during this process you are likely dead. Zuk’s ranged attack can and often will hit up to 115 – if you tank a hit and survive you should consider yourself lucky. As if that wasn’t bad enough, throughout the entire fight you have to deal with other monsters from The Inferno spawning every two minutes – including TzTok-Jad. When these monsters spawn, you must switch your attention to dealing with them promptly as their attacks will eventually destroy your precious pillar, opening you up to take a fatal hit from Zuk. It is highly recommended to research the waves and the final boss fight thoroughly before making your own attempts. You can do that right here by checking out PotUpSonRS’s video on the right or check out some of these other popular guides below. The Elysian Spirit Shield can be swapped for a Crystal Shield (i), the shield MUST be imbued, one shield will last well over 40 attempts. Your Rune Pouch should contain Death, Soul, and Blood runes. Your Kodai Wand will supply the water runes. The Kodai Wand’s autocast should be set to Ice Barrage before every wave. Your Bastion potion will only be used one time on wave 68 (3 x Jad Start), and three times on wave 69 (Begining, Jad, and Healers). NOTE FROM EDITOR: This variation of the Inferno is incredibly difficult, and only recommended in the case of Ironmen who may have trouble procuring the items needed to do it the optimal way. The inferno is an difficult feat when done optimally, understand this when making your attempts.